The Manuka Health Propolis and MGO 500 Manuka Honey Throat Spray is a powerful combination of Propolis, MGO™400+ Manuka honey and essential oils including Myrrh, Peppermint and Aniseed for instant soothing of the mouth and throat. Alongside soothing sore throats, the spray helps to maintain oral health, boost the immune system and even freshen breath. 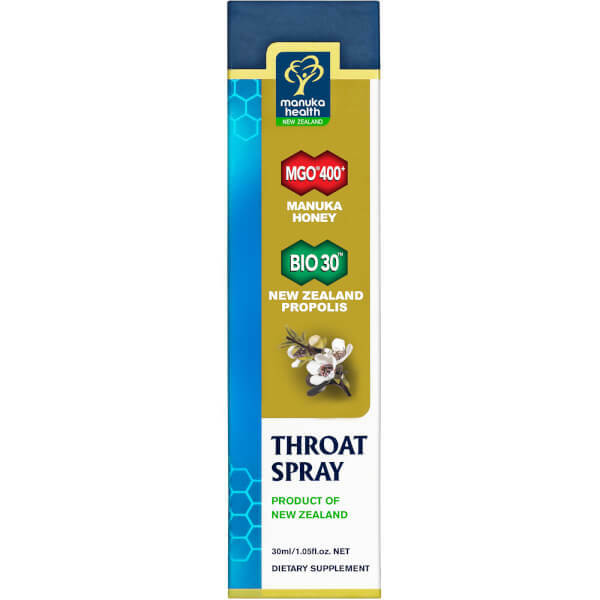 Blended with MGO™400+ Manuka Honey, renowned for its unique activity and antibacterial properties, the spray helps to combat a sore throat by halting the growth of Strep bacteria. 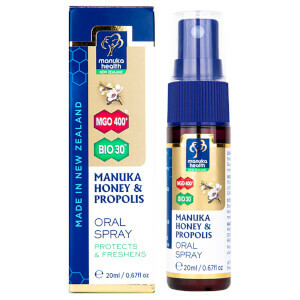 The spray is also concentrated with Propolis, an ingredient gathered by bees in New Zealand and used to protect their hives against infection. Propolis within the spray works as ‘nature’s antibiotic’ due to the antioxidant and antiseptic properties of bioflavonoids. Propolis may cause allergic reactions in allergy sufferers. Not suitable for children under 2 years of age. Shake well before use. Spray into the mouth or throat 3-4 times daily.